How is MSE working with polymers? A polymer (the name means "many parts") is long chain molecule made up many repeating units, called monomers. Polymers can be natural (organic) or synthetic. They are everywhere: in plastics (bottles, toys, vinyl siding, packaging), cosmetics, shampoos and other hair care products, contact lenses, nature (crab shells, amber), food (proteins, starches, gelatin, gum, gluten), fabric, balls, sneakers, and even in your DNA! 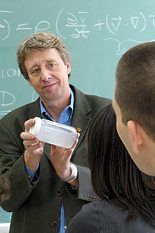 An expert in polymer science can find work in almost any industry. How much polymer does it take to turn water into goop? Polymer chains interpenetrate each other when dissolved in solvent. 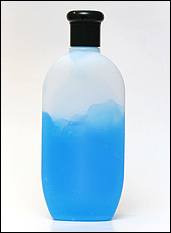 In this picture the bottle contains a highly viscous polymer solution made from only 2% high molecular weight poly(ethylene oxide) dissolved in 98% water. A high molecular weight polymer can be 10,000-100,000 monomers long! How is MSE at UMD Working with Polymers? A new way to treat viruses: Dan Janiak, an alumnus of the MSE graduate program, developed a polymer called a molecularly-imprinted hydrogel that could be used to filter viruses out of your blood! It's not abstract art or a weird wallpaper pattern... these shapes are formed by the self-assembly of a thin film of a block copolymer, one of a class of polymers that contain groups (or "blocks") of different monomer molecules joined end-to-end. The black areas represent pits or low points in the film. Designed by the research group of MSE Professor Robert M. Briber in collaboration with NIST, these polymers can be used to create patterns that would serve as templates in the manufacture of nano- or microscale electronics. "Happy" Ball, "Sad" Ball - These two balls look, but do not behave, in the same way. When dropped, the "happy" ball will bounce while the "sad" one will not. This is because the "happy" ball is made of neoprene, an elastic polymer, and the "sad" ball is made of polynorborene, a polymer material designed to absorb energy. The polynorborene ball absorbs the impact when it hits a surface, causing it to "drop like a stone." Materials like polynorborene could be used in athletic shoes to absorb energy during running or jumping, preventing shock to the foot or leg. Super absorbent polymers are a special class of polymers called polyelectrolytes that have a charge on the polymer chain that increases the solubility in water. They are generally used in the form of small particles that are crosslinked so they will form gel rather than completely dissolving. The polymer gel absorbs water and the charges along the chain repel each other, stretching out the chain and enhancing the swelling of the gel. Super absorbent polymers can readily absorb 100 times their volume in water! Super absorbant polymers are used in products like disposable diapers, for cleaning up water based environmental spills, and for preventing rain water runoff in agricultural areas. Polymer Chains: "Polymer in a Can"
Our "polymer-in-a-can" demonstration shows relative size of a polymer chain scaled up to macroscopic dimensions. If an equivalent molecular weight is calculated for the "chain" shown in the movie (assuming a polyethylene molecule), the value is about 80,000 g/mole. This is a relatively low molecular weight polymer and many applications for polyethylene would require a significantly higher molecular weight to attain good mechanical properties. Watch a movie demonstrating "polymer in a can"
Learn how plastics are used in vehicles, electronics, packaging, and construction; how plastics contribute to safety and can help you save energy; how they are recycled; and how people are doing more with less plastic than before. John Sizemore offers movies on a variety of topics on his Dailymotion site. His "Zoom Into..." series of videos about materials includes Zoom Into Plastic. Polymers may have the qualities of liquids or solids. 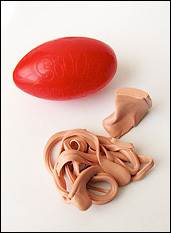 Silly Putty is a great example of a polymer with both: when pulled slowly, it is fluid, but if yanked apart it snaps and breaks like a solid. Treats like gummies and Jell-O contain gelatin, an edible polymer. 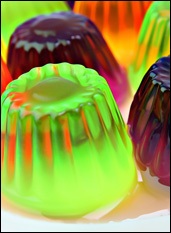 Gelatin is also used to make drug capsules and many other things, including film for movies and cameras. 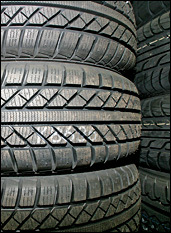 Rubber is a polymer and the plastic bottle and the shampoo in it contain polymers.